When you stay at Les' Loges du Ried in Marckolsheim, you'll be 14 minutes by car from Cigoland. Featured amenities include multilingual staff and luggage storage. Free self parking is available onsite. With a stay at this cottage in Fayence, you'll be 18.2 mi (29.2 km) from Frejus Amphitheatre and 23 mi (37 km) from Frejus Cathedral. Free self parking is available onsite. 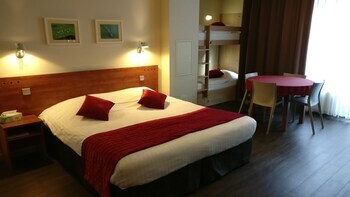 With a stay at this apartment in Morzine, you'll be minutes from Espace Aquatique and Morzine Tourist Office. Free self parking is available onsite. With a stay at this apartment in Colmar (Colmar Centre Ville), you'll be steps from Little Venice and 3 minutes by foot from Saint-Matthews Protestant Church.